In his revolutionary bestseller, The Long Tail, Chris Anderson demonstrated how the online marketplace creates niche markets, allowing products and consumers to connect in a way that has never happened before. Now, in Free, he makes the compelling case that in many instances businesses can profit more from giving things away than they can by charging for them. Far more than a promotional gimmick, Free is a business strategy that may well be essential to a company’s survival. 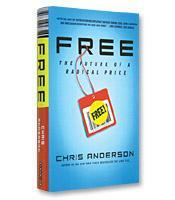 Why Free is the new competitive price. How technology is changing the future of business models. The four business models of Free. Why Free is more than a gimmick or a marketing scheme. How reputation and attention have become currencies of the Web. How Google has pioneered the Free model.